Ecuador is one of the most bio-diverse places in the world, offering an endless range of attractions to explore; it hosts warm sunny beaches of the Pacific, impressive mountain villages of the Andes, the Amazon rainforest, and the ecological wonder of the Galapagos Islands, and is home to five World Heritage sites. Ecuador has a relaxed pace, hospitable and friendly people, a rich culture and history, glorious architecture, magnificent scenery, and spectacular weather. 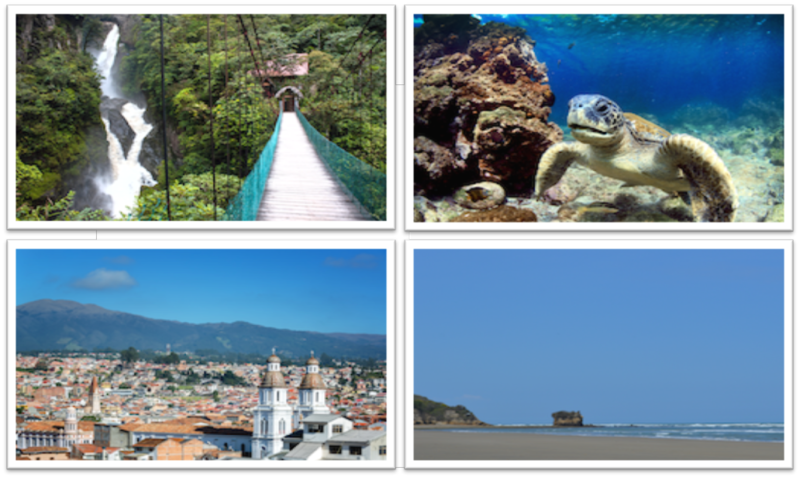 In addition, Ecuador has quality and affordable health care and an extremely low-cost of living; it is no wonder it consistently ranks high among the most beautiful places to retire. The cost of living in Ecuador influenced many North Americans and Europeans to choose Ecuador as their retirement destination. It is not just the property values, low carrying, and maintenance costs that makes Ecuador more affordable; it is the low annual cost of living when compared with that of other places. Ecuador’s official currency is U.S. dollars so you will have no problem determining the cost of things. Local products and labor are extremely reasonable and the local markets offer a large variety of fresh fruits, vegetables, cheeses, eggs, flowers, poultry, meat and seafood at prices much lower than found in North America. With the real estate crash of 2008, home prices may seem inviting in the south of the United States, but what really separates Ecuador from typical seaside communities, in the United States, is the low cost of maintaining your investment property taxes. On a seaside home, taxes are typically less than $100 per year and maintenance on HOA fees are typically around $1,000 per year. You will have access to an excellent level of medical care in Ecuador. Bloomberg ranked Ecuador as the 13th most efficient healthcare system in a 2014 study. In the bigger cities, such as Quito, Cuenca, Manta, and Guayaquil, hospitals are equipped with the latest in medical technology, staff that is fully trained, and has qualified doctors and nurses in all fields; in fact, many have trained in the US and the UK. The cost of an average visit to a doctor’s office is in the region of $30, with a visit to a specialist costing a little more at around $40. This price is considered to be reasonable as Ecuadorian doctors spend on average between 30 and 45 minutes with each patient. As a general rule, you will find that average health care in Ecuador costs between 10% and 25% of what you might expect to pay in the U.S. To purchase health insurance in Ecuador you will pay only a fraction of the cost of similar policies in the UK or the US. The dentists are well trained and professional and treatment is much cheaper than private dental treatments in other countries. Your local embassy can help you find medical professionals who speak English so that if you do not speak Spanish fluently, you can have peace of mind that your illnesses are not getting distorted in translation. People often think that because Ecuador is on the equator that the weather is hot and sticky, like you will find in Panama or Costa Rica. Nothing could be further from the truth. In fact, the weather in Bahia de Caraquez is very similar to that of Hawaii. In Bahía, there has never been a hurricane or tropical storm, and lightning is extremely rare. Bahía is in a dry tropical belt only about 60 miles wide; there are even cacti growing on the property. During the day, temperatures rarely go over 90 degrees fahrenheit (32 C), and the evening are usually cool and comfortable around the low 70s. The so called “rainy season” last about 4 months (January to April) during which we rarely experience rainfall during the day. It usually rains 1 to 2 times per week at night. The ocean water is warm all-year long, averaging 77 degrees Fahrenheit. The wind usually comes from the ocean and is a gentle breeze (averaging 5-8mph) that helps with keeping the warmer days very enjoyable. Most tourists agree that it is the people of Ecuador that make the experience truly memorable. Although close to half of the population lives beneath the poverty level, the people you meet are happy and generous; they are incredibly hospitable and enjoy helping foreigners. The people of Ecuador are proud of their country and are happy that others appreciate the beauty of their country as much as they do. Surprisingly, Ecuador boasts one of the highest literacy rates in the world, out pacing even that of the United States and Canada. An investment in Ecuadorian real estate is similar to investing in Costa Rica fifteen years ago. Ecuador is the right place at the right time. The continuous initiatives happening in Ecuador have had a dramatic impact on the country’s economy and also have been a catalyst for other foreign investments and high growth in tourism. Ecuador’s cost of living is 70% lower than that of North America and 40% cheaper than either Costa Rica or Panama. Combine the low cost of living with excellent, accessible health care, and you have a country ripe for investment. The current price of oceanfront homes in Costa Rica, Panama, and Mexico exceed $750,000; it is easy to see why a significant percentage of the 100 million plus baby boomers retiring over the next 10 years will select Ecuador for their vacation and retirement homes.